I decided to use this blog as a place to document my last year's holidays in Africa before I forget all adventures that we had there. This post describes how we decided where to go for holidays. Already two years before the trip Jochen and I agreed that we wanted to go for longer holidays between our PhD and postdoc positions. I was hoping that we could travel even as long as half a year, but Jochen could not imagine himself not working for longer than 3 months. He wanted to travel in Australia and New Zealand, whereas I prefered to travel in South America. After a short discussion we both agreed on traveling for 3 months in South America. The plan got changed three months before the holidays. First, we had to shorten them to two months because of Jochen's other obligations. Second, as the time of our move to the US was approaching, we also realized that we wanted to spend more quality time with some of our friends. Around the same time Fede and Elena were planning two/three weeks of holidays in Madagascar. After four of us met and discussed what we wanted, we decided to spend together three-and-a-half weeks in Kenya, Uganda and Tanzania, after which Jochen and I would continue our holidays in South Africa and Namibia for another month. 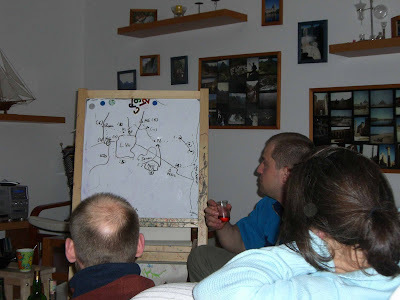 We started planning our trip to Africa on the 23rd of May 2006, which is two months in advance!